2. As a temporary event tent, we do not recommend leaving set-up over several days, in windy or adverse weather conditions. 3. When it is used in rainy days, make sure that no water accumulates on the top, or else the tent may collapse. 4. Replacements:- We honor our Customers w/Replacement Parts for anything they need. Each Part you need is available for a very reasonable price. Each metal pole is $10, each plastic connector is $5, this is if you broke it, not if it comes defective. 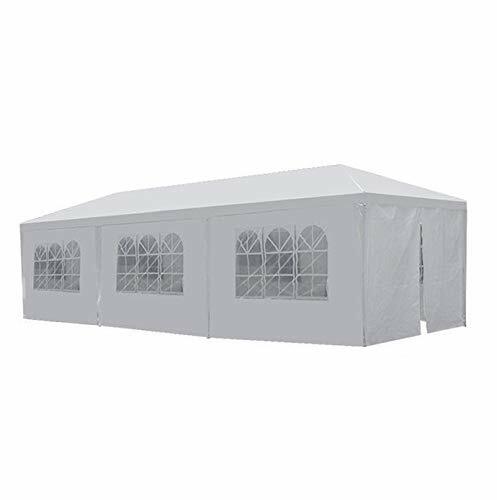 Our high quality GOJOOASIS tent can be carried easily and perfect for many outdoor needs, such as weddings, camping, commercial or recreational use-parties, yard sales, trade shows and flea markets etc. With solid steel frame in polyester covering offers the ultimate shade solution. Enjoy to entertain your friends or family member in this great GOJOOASIS tent! If you have any questions about this product by GOJOOASIS, contact us by completing and submitting the form below. If you are looking for a specif part number, please include it with your message.